Arus Men's Monk Robe Style Full Length Long Hooded Turkish Terry Cloth Bathrobe. Machine Wash - Tumble Dry Low - No Iron. ANKLE LONG TERRY CLOTH BATH ROBE WITH HOOD Monk Style Turkish Terry Cloth Cotton Robe with Hood is a unique design inspired from a traditional robe, for customers looking for an ankle length luxury bathrobe made of Turkish cotton. You may wear it after shower, bath, sauna, gym or pool. Manufactured from 100% high grade cotton with extra long fibers grown in the Aegean region in Turkey. SOFT and BREATHABLE - Durable and Heavy, Premium Cotton Terry construction with single ply loops on the inside and on the outside make it absorbent, plush and gentle to your skin. It will get softer with each wash because of the quality of long staple Turkish Cotton and keep you warm when needed. MODEL- Tall Ankle Length Tericloth. Wide cut hood on the back for comfort. It will absorb moisture with terry towel loops inside the robe. Patch pockets on both sides are ideal to keep your hands warm or to store your personal items. MULTIPURPOSE This Long Hooded Bathrobe for Men is a perfect gift for any occasion. Gentlemans bath wear essential to travel robe, you may use this luxury robe for your guests at home, give as an anniversary, wedding or Christmas gift bathrobe on a special occasion, use as a house coat or simply enjoy for your own relaxation. SIZING AND PRODUCT CARE - Available in Sizes S - M - L - XL and XXL in Black, Navy Blue, Burgundy, Chestnut Brown and Hunter Green colors. Please refer to the Size Chart table below for additional measurements. Easy to care, we advise machine wash with like colors, tumble dry with low heat and no iron. You may wash your luxurious hotel quality bathrobe with other bath towels. 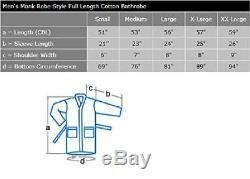 Big and Tall Monk Style Ankle Length Turkish Cotton Long Towel Bath Robe for Men. Definition of a Luxury Bathrobe. Unique in design and lavishly extravagant, MONK LUXURY Style Terry Cloth Hooded Robe by Arus is a floor length cotton robe that is durable, heavy and will keep you warm when needed. Whether you use it for in and out of the hot tub on cold days, smoking robe, bath wear or as a house coat robe for relaxing in your daily routine, this robe will meet your expectations. Style: Hooded Terry Cotton Full Length Bath Robe for Men. Available in 5 Sizes and 5 Colors. Machine Wash with like Colors Tumble Dry Low Heat. Patch pockets on both sides to store your personal items. Adjustable sleeve length with turn back cuffs. Sizes run large, please refer to the Product Description below for measurements. Premium 100% Terry Cloth Hooded Robe down to your ankles. True ankle length Turkish robe, this Men's Long Hooded style is available in 5 colors and 5 sizes with length up to 59 inches. Manufactured with High Grade Cotton with long fibers grown in the Aegean region in Turkey, it has terry cotton construction on the inside and on the outside providing unmatched absorbency of Turkish toweling. Unique quality to Turkish cotton, it will get softer with each wash because of the quality of cotton. Quality material, skilled craftsmanship and attention to detail. Every detail, every stitch is made to create the perfect bathrobe for you. Monk Style Hood on the back covering shoulders. Wide Cut Belt for a comfort fit. Patch Pockets on both sides for personal items. Turn Back Cuffs to adjust sleeve length. Available in 5 sizes (Small - Medium - Large - XL - XXL). Offered in colors Chestnut Brown, Burgundy, Navy Blue, Black and Hunter Green. Small=51", Medium=53", Large=56", XL=57" , XXL=59. Small=21", Medium=23", Large=24", XL=25" XXL=26. Small=7", Medium=8", Large=9", XL=9" XXL=10. D = Wide Cut Bottom Circumference. Small=69", Medium=76", Large=81", XL=89", XXL=94. Highly absorbent and durable, thick and plush Turkish Terry Cotton construction. Breathable, soft and gentle to your skin, 100% Turkish Terry Cotton will get softer with each washing and last for a long time. Machine Wash with like Colors. Tumble Dry - Low or No Heat - Do Not Iron. What is so special about Turkish bathrobes? There are different qualities of raw materials used for different types of bathrobes in the market. The highest quality is called the High Grade Cotton known for its softness. We offer the best prices around on high quality products. Our E-store includes media such as books, movies, music and games while offering electronics, toys, sporting apparel, clothing, tools, general home, garden items and more. We are always working hard to ensure your package arrives as soon as possible. Customer is responsible for the the return shippung cost. We do not accept a return of physically damaged items. We're happy to help. The item "Arus Men'S Monk Robe Style Full Length Long Hooded Turkish Terry Cloth Bathrobe" is in sale since Tuesday, October 30, 2018. This item is in the category "Clothing, Shoes & Accessories\Women's Clothing\Intimates & Sleep\Sleepwear & Robes". The seller is "super_cheap_deals" and is located in US, United States.